The Empress is the friendlier, more approachable aspect of the female archetype. She stands for maternity, love and mercy; at the same time she's a symbol for sexuality and emotion. She is pure feeling, absolutely unintellectual, but basically life. 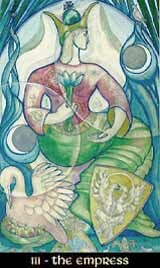 The Empress is the Great Mother, representing the beginning of all life. She is the power of nature, causing change, renewal, major plans.